Reader feedback is always welcomed here. Send your thoughts to Draft King at LouPickney@gmail.com. The current Collective Bargaining Agreement between the NFL and the NFLPA expires at the end of the day on March 3, 2011. That means that if a new deal isn't agreed to by the owners and players by Thursday night (and there's no indication that one is imminent), Friday will dawn a day without a CBA in place. Once that happens, most everything (save for the draft) NFL-related is set to shut down. NFL teams are scurrying now to sign their own players whose contracts expire with the end of the league year -- or to cut players who cost too much relative to their production. 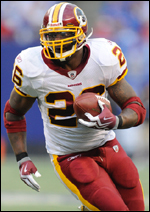 The latest cut victim today was Clinton Portis, who the Redskins have jettisoned. Portis, who turns 30 in September, was slated to earn $8.3 million in base salary for 2011. There were future salary cap ramifications to consider for Washington (if the cap is part of a new CBA), as Portis had three years left on his contract. One player you won't see cut before the end of the CBA is Vince Young. Specific language in his contract gives Young a $4.5 million bonus on the tenth day of the 2011 NFL league year. But without a new CBA, the new NFL year can't begin. As a result, Young has found himself in a holding pattern. Tennessee hopes to trade Young once a new CBA is agreed upon, though if they can't work out something nine days into the new year, the team will like have to cut Young so they aren't on the hook for the $4.5 million bonus. The 2011 NFL combine in Indianapolis wraps things up tomorrow. My observation has been that the combine receives far more attention than it deserves, particularly with the high-end players saving their workouts for their college's pro day. Most interesting to me are the height/weight reality checks that many players face. A prime example of this is Nick Fairley, who had been listed as either 6'4" or 6'5" but was revealed to be 6'3". That might seem to be a minor point, but for teams drafting at the top trying to decide between similarly-skilled players, little things can sometimes make a big difference. You don't have to be super-tall to be an effective 4-3 pass-rushing defensive tackle. To point, Warren Sapp is just 6'2", yet he managed to record 96.5 sacks during his NFL career. But, for those who thought that Fairley could do all he did at Auburn at 6'4" or 6'5", Fairley measuring in at 6'3" was a bit of a reality check. As for Fairley and the #1 spot, which is where he is currently positioned on the 2011 Draft King NFL Mock board, there are whispers that Fairley isn't seen by some general managers as being #1 overall pick material. Most telling was this Twitter post by Darin Gantt, a Panthers beat writer for the Rock Hill Herald and Charlotte Observer. He wrote, "At one point, I thought Fairley could go 1. After talking to people who get fired for being wrong, I no longer do." Hmm. I don't necessarily concur with the thought that Fairley isn't in the running for the #1 overall spot, and even those with doubts I'd imagine wouldn't outright rule him out. But it doesn't help his case, not with some looking at Alabama 3-4 DE (and possible 4-3 DT) Marcell Dareus as a superior prospect. But the draft is nearly two months away, and there are plenty more drills and interviews and tape breakdowns to go between now and the start of the 2011 NFL Draft. Draft King is owned and operated by Lou Pickney. � 2003-2019, all rights reserved. Unless otherwise noted, the views expressed here are those of Lou Pickney alone and do not necessarily reflect those of any media company.